Acclaimed author’s long-lost first novel is finally available. In a jungle village an old man sees a strange girl who has collapsed in a field. Once a holy man, he is sure she is not an evil spirit. He carries her inside and puts her in a hammock, despite his wife’s warning that the girl is the evil Xtabay, pretending to be lost and exhausted. The girl has fled her home in search of a mysterious boy who wandered into her village. She senses in him her own despair and loneliness: “I loved him with the intensity of my soul and heart and body,” and intends to follow him to the “great modern city” he was seeking. Using archetypal figures — the man, the boy, the woman, Rechy’s Pablo! is steeped in indigenous myths and superstitions. Restless spirits roam the dark jungle howling for redemption amid the pyramids of their ancestors, witches predict doom and snakes stir ancient curses, like the disastrous loss of crops. Native religious rituals conflict dangerously with the Catholic religion. The novel is framed by the Mayan legend, “And the soul must wander aimlessly until the sun and the moon shall fuse.” Like the forgotten bride who longs endlessly for the elusive sun, the girl searches for the boy in the vast modern city. At the book’s core, Rechy explores mankind’s longing for connection, for the surcease of evasive love. John Rechy wrote this first novel in 1948-49 when he was 18 years old. Unpublished, it languished in Special Collections at Boston University until a chance encounter with University of California, Santa Barbara scholar and critic Francisco Lomelí led to the ultimate publication of this long-lost treasure by the acclaimed author of the groundbreaking novel, City of Night. 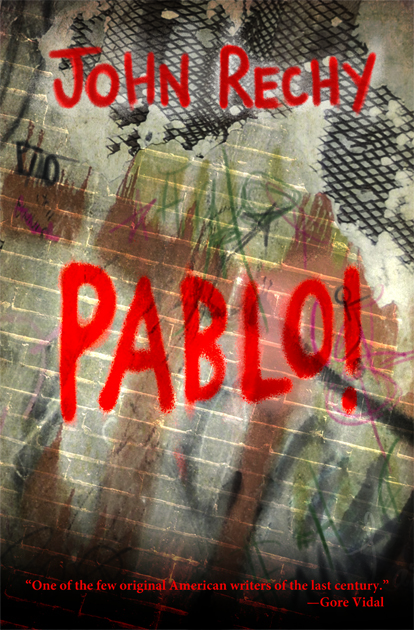 Click here to listen to an interview with John Rechy about his book, Pablo!. JOHN RECHY is the author of seventeen books, including The New York Times best-sellers City of Night and Numbers, the Los Angeles Times best-sellers The Coming of the Night, The Life and Adventures of Lyle Clemens and The Sexual Outlaw (all from Grove Press). He is the recipient of PEN Center USA’s Lifetime Achievement Award, the Los Angeles Times Robert Kirsch Award, the William Whitehead Award for Lifetime Achievement and the Luis Leal Award for Excellence in Chicano/Latino Literature. He is the first recipient of the Los Angeles Review of Books-University of California, Riverside Lifetime Achievement Award.